Truck Loses Brakes On A Steep Descending Road! Here’s some great driving skills by a driver whom have kept the momentum alive as the truck was rushing down a steep descending road with no brakes. Good thing the driver did not allow panic to take control and was able to maneuver the truck so as to only cause minimal damage. 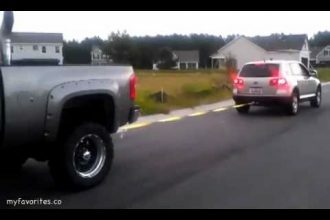 He successfully avoids other vehicles before eventually coming to a stop through crashing with a relatively larger truck. Driver managed to avoid a number of collisions with the run ending with two people injured including the driver. Check it out too with the video given below.